VANCOUVER, Nov. 27, 2017 /CNW/ - Hannan Metals Limited ("Hannan" or the "Company") (TSX.V: HAN) (OTCPK: HANNF) is pleased to announce results from a further two diamond drill holes completed as part of a resource expansion program at the 100%-owned Kilbricken zinc-lead-silver-copper deposit in County Clare, Ireland. To date, five holes have been completed by Hannan at Kilbricken, and one in progress for a total of 4,160 metres. A 6,500 metre resource expansion drill program is ongoing, with two drill rigs now at site to test along strike and down dip from the mineral resource area (Hannan Press Release, 10 July, 2017). Drilling will continue through to Q1 2018. 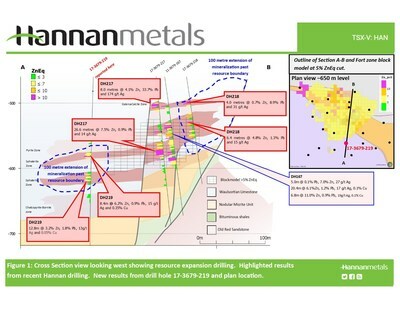 The drill program is now progressing to larger 300-500 metre step outs from existing resources, targeting additional base metal mineralized bodies adjacent to Kilbricken. Mr. Michael Hudson, CEO and Chairman, states: "Our maiden drill program at Kilbricken has started with an impressive hit rate, with reported drill holes extending mineralization up to hundreds of metres beyond the resource area. All holes demonstrate significant widths and high grades of base metal mineralization (Table 1) consistent with those found in the resource areas at Kilbricken. This success has provided confidence to move into the next phase of our drill program, with larger 300-500 metre step outs from the Kilbricken resource, to target additional stand-alone base metal mineralized bodies. Strong geochemical and geophysical anomalies are being drill tested along strike and dip from Kilbricken (Figure 1), and with two drill rigs turning the potential for discovery and resource expansion is high." Plan and cross section views of the drill results are provided in Figures 1-3. Table 1 shows highlight intersections from all holes drilled to date and Table 2 shows all relevant collar and assay information. The true thickness of mineralized intervals at Kilbricken is interpreted to be greater than 95% of the drilled thickness. In addition to above, hole 17-3679-221 ("DH221"), a 150 metre step-out from the Fort Zone, was completed at 763.4 metres depth and is now being logged and assayed. Hole 17-3679-222 ("DH222"), a 800 metre step-out from the Fort Zone and 150 metres down dip from the Chimney Zone, remains in progress. Hole 17-3679-223 ("DH223") a 500 metre step out to the north of the Chimney Zone, targeting shallower mineralization identified by recent soil sampling, remains in progress (Hannan News Release Oct. 10, 2017). (Figure 1, Table 2). The maiden mineral resource for Kilbricken was published on July 10, 2017, and immediately ranked Kilbricken as one of the top ten base metal deposits discovered in Ireland by tonnes and grade. Total indicated mineral resources were calculated as 2.7 million tonnes at 8.8% zinc equivalent ("ZnEq"), including 1.4 million tonnes at 10.8% Zneq and total inferred mineral resources of 1.7 million tonnes at 8.2% ZnEq, including 0.6 million tonnes at 10.4% ZnEq. Importantly, as DH218 shows, the initial resource is expandable at all scales, from near-resource to prospect scale. 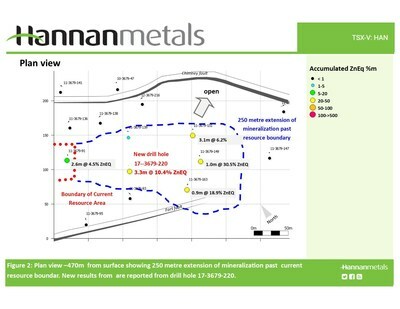 On August 22, 2017, Hannan filed an independent National Instrument 43-101 Technical Report (the "NI 43-101 Technical Report") on The Mineral Resource Estimate for the Kilbricken Zinc-Silver-Lead-Copper Project Co. Clare, Ireland For Hannan Metals Ltd in support of the Company's news release dated July 10, 2017. The NI 43-101 Technical Report was authored by Mr. Geoff Reed of Reed Leyton Consultants and Dr. John Colthurst who are independent "qualified persons" as defined by National Instrument 43-101. The NI 43-101 Technical Report may be found under the Company's profile on SEDAR at www.sedar.com and on the Company's website at www.hannanmetals.com. A diamond drill rig from Priority Drilling Limited with water recirculation and drill cuttings collection systems was used for the drill results reported here. Core diameter is NQ2 (50.6 mm). Core recoveries were excellent and average close to 95-100% in fresh rock. After photographing and logging, core intervals averaging 1-2 metre for mineralized samples were cut in half at Hannan's core facilities in Ennis, County Clare, Ireland. The remaining half core is retained for verification and reference purposes. Analytical samples were transported by Hannan personnel from site to the ALS Loughrea located at Dublin Road, Loughrea, County Galway, Ireland. At the laboratory samples are dried, crushed to 100% passing 2mm, then 500 grams pulverized for multi-element analysis by method ME-MS6, a four-acid digest performed on 0.25 g of sample to quantitatively dissolve most geological materials. Analysis is via ICP-MS + ICP-AES. Samples assaying over range 1% zinc, lead, or copper and 100 g/t silver were re-assayed using methods Ag/Pb/Zn-OG62, a precise ore grade method to determine lead, zinc and silver by HF-HNO3-HClO4 Digest, HCl leach and ICP-AES. The QA/QC program of Hannan consists of the systematic insertion of certified reference material of known base metal content and blanks at the start of each batch and within interpreted mineralized rock. In addition, ALS inserts blanks and standards into the analytical process. 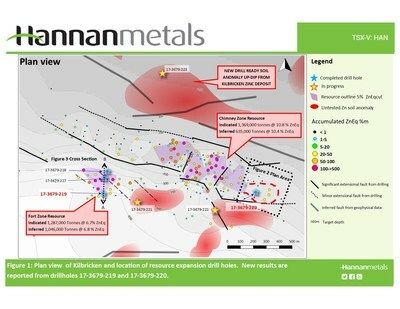 Hannan Metals Limited has 100% ownership of the County Clare Zn-Pb-Ag-Cu project in Ireland, which consists of 9 prospecting licences for 32,223 hectares. Zinc remains in tight supply amidst rising demand and stagnant supply. Ireland is a leading global jurisdiction for zinc mining and exploration. In 2015, Ireland was the world's 10th largest zinc producing nation with 230,000 tonnes produced. Over the last decade, the team behind Hannan has forged a long and successful record of financing and discovering mineral projects in Europe. Additionally, the team holds extensive zinc experience, gained from the world's largest integrated zinc producer of the time, Pasminco Ltd.
Mr. Michael Hudson FAusIMM, Hannan's Chairman and CEO, a Qualified Person as defined in National Instrument 43-101, has reviewed and approved the technical disclosure contained in this news release. Certain information set forth in this news release contains "forward-looking statements", and "forward- looking information" under applicable securities laws. Except for statements of historical fact, certain information contained herein constitutes forward-looking statements, which include the Company's expectations regarding future performance based on current results, expected cash costs based on the Company's current internal expectations, estimates, projections, assumptions and beliefs, which may prove to be incorrect. These statements are not guarantees of future performance and undue reliance should not be placed on them. Such forward-looking statements necessarily involve known and unknown risks and uncertainties, which may cause the Company's actual performance and financial results in future periods to differ materially from any projects of future performance or results expressed or implied by such forward-looking statement. These risks and uncertainties include, but are not limited to: The Company's expectations regarding the current drill program, liabilities inherent in mine development and production, geological risks, the financial markets generally, and the ability of the Company to raise additional capital to fund future operations. There can be no assurance that forward-looking statements will prove to be accurate, and actual results and future events could differ materially from those anticipated in such statements. The Company undertakes no obligation to update forward-looking statements if circumstances or management's estimates or opinions should change except as required by applicable securities laws. The reader is cautioned not to place undue reliance on forward-looking statements. Table 1: Highlight intersections from DH 217-221 during the maiden Hannan resource extension drill program at Kilbricken. The zinc equivalent (ZnEq) value was calculated using the following formula: ZnEq% = Zn % + (Cu% * 2.102) + Pb% * 0.815) + (Ag g/t * 0.023) with assumed prices of Zn $2587/t; Cu $5437/t; Pb $2108/t and Ag $18.44/oz.